I recently submitted this work for an exhibit. That process caused me to look at it closely again, as it was on my computer screen in detailed enlargements. I remembered the process. Some things went as planned. Some things I had not expected. From the beginning, I knew I wanted the feel of nighttime. I wanted to recreate the sensation of being outside on a cool evening, dipping one’s toes into the night air. I had a nice reference photo to work from. My neighbor, a lovely young woman, had come over to my house to pose for me. The porch is my porch. But, in the process of creating the composition, I did some angle adjusting and some perspective playing, making it more interesting than the original photo had been. I worked almost exclusively with sheer fabrics as I printed the images. This created a watercolor-wash feel that worked well with the feel of dream and memory I hoped to create. I worked this piece in squares. That’s not my normal way of constructing pieces. But it created some tensions that I found interesting. I don’t think the squares jump out immediately, but they are there, as a background architecture behind the trees. The trees overlapping the grid and working in relation to it create a nice tension of foreground and background. And, because I did not use squares in the section with the young woman, she is in a reality somewhat separated from everything else. 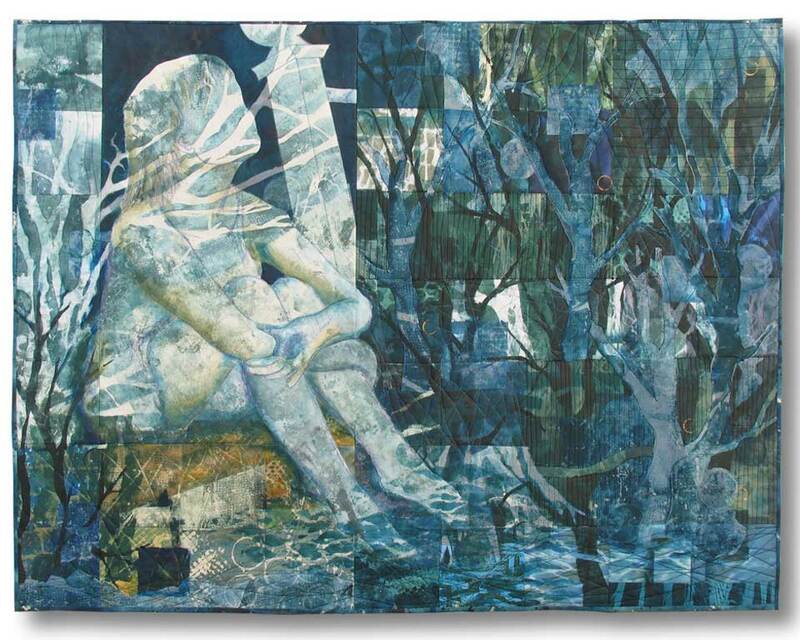 Becoming One With The Night 2017 35" x 45"
In my studio this week I have begun a series of smaller art quilts that are simple compositions combining images of home with images of water, and tree silhouettes connecting the two. This feels completely natural to me. As I construct the house sections, piecing in reflecting waterlilies or photo transfers of rippling water intuitively seems just right. And yet – logically – water and a home are not a good mix. Nobody wants to find water seeping in from a wall or roof. The term “underwater” regarding a home is not desirable. And severe weather can damage or destroy a home with water. So, I’ve been thinking through what this is about. I think that what I like about water is its quality of hidden life. I find it mesmerizing to sit by a body of water and just look down into the surface. Below there is another world. Sometimes life forms are visible: fish, moving plants. Much of the life is microscopic and invisible. But it’s there. At the same time that it is mysterious, water is soothing. Imagine the sound of moving water. Waves against a beach. Ripples and splashes over rocks. People are just drawn to the sound of water. The series of art pieces I’m creating about home invites viewers to enter their memories and dreams of home. It is not intended to be a logical journey, but an emotional one. The water forms inside are a vehicle to enter that emotional place of remembering. Have you said good-bye to a home? It is like losing a close friend, causing you to want to touch it one last time, to trace favorite portions with your hand before walking away. Remember the feel of the front step. Remember the sound of the door opening. This week, as I am creating artwork about home and memories in my studio practice, I am also saying good bye – again – to a home. I am not a housecleaning fan. I remember once reading a beautiful soulful essay which included words about the meditative power of cleaning baseboards. I thought, “really?” This weekend I cleaned baseboards, and it was, in fact, an act of reflection. The house I lived in for six years, the house that was a landing place when life changed, is now a house I own and use for rental income. It’s about 900 square feet and not fancy at all. I loved being there. But I left intentionally and willingly when it was time for me to form a new household. It was my home. Now it’s not. I cleaned baseboards in preparation for a new tenant to move in. This is now the second tenant, so I have experienced the transition of this home once before. It was left in good shape, so the prep work required has not been daunting. I have cleaned, patched walls and replaced carpet in one room thinking about new inhabitants and a new stage for this house. Images of home and memories of home are so compelling! Home is where our memories begin and are formed. Home is a combination of a physical place and all that happens there. Home shapes us, in ways that may be nurturing or poisonous, or some of both. I am thinking of all these qualities of home as I continue in my current series. I do not believe I could have created this work earlier in my life. There were too many layers still covered. Now, the work is a way to peel back the layers and dig into the rich soil of all that grows from such memories. It is my way of saying “hello” to the concept of home. This happens all the time in TV detective shows. Frustrated with the case, the detective throws some photos on the desk and then – amazingly! – says “Wait a minute. We’ve missed something.” Some little detail in the photo, previously overlooked, solves the mystery. My e-mailed photo was almost like that. My sister had sent me a photo of a new painting in her home. I opened it, took a look, realized that the glare in the photo kept me from seeing much of the painting, then closed the photo. Wait a minute. I missed something. I opened the photo back up and found something else in the photo that was much more interesting. The window. The window in the room she had photographed has wonderful character. Wood trim and frame create interesting depth and shadows. The light through the panes turned the glass panes into abstract compositions. It’s just the kind of window image I was looking for to incorporate into a planned art quilt. 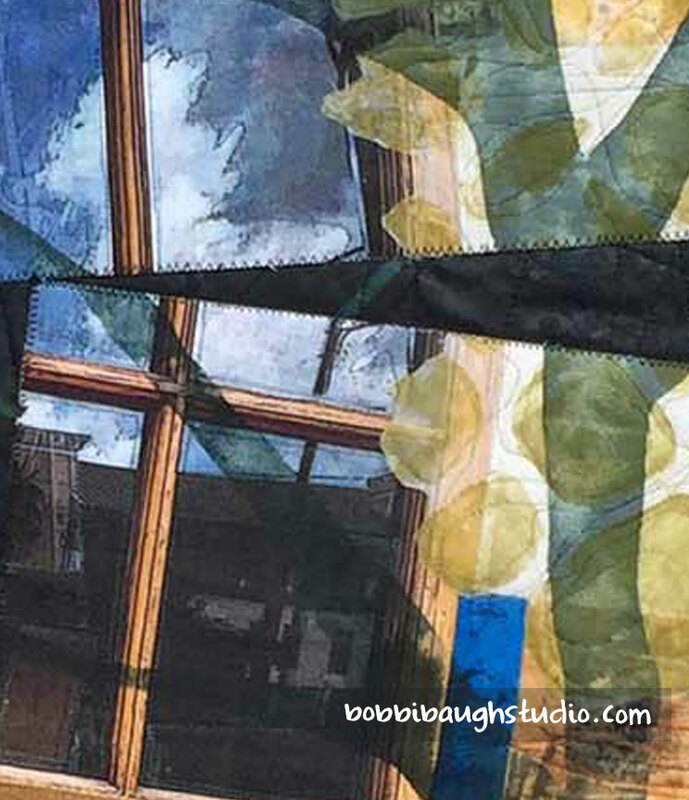 I have already asked her to shoot a few more images of the window and have enlarged and cropped them – ready for transfer onto fabric. I am strongly drawn to window images. Incorporating a window into a picture plane automatically creates depth: theirs is something on the other side. And looking through a window invites participation of the viewer in the image. Windows often reflect; we see back an unexpected image. When I collage into a window pane a scene or pattern different from what was in the original photo, a new kind of reality is created. My e-mail brought me both an unexpected image and an unexpected inspiration. The photo above is a detail from a work in progress, “Look through the Windows,” part of my current series: Home is What You Remember. I have combined photo transfer windows with painted window shapes. Deep Down Roots… Where do they Go? This work has recently been completed. I finished up the binding and backing. This gave me a chance to look at it again and remember some of what I thought about as I was creating it. I am interested in combining realities. First in this piece is the combining of photographic reality with patterned monotypes. The photo transfer appears inside the house (the closeups of twigs) and also in the underground section (the pattern of water). I created patterns of hand-printed fabrics to be a visual metaphor for the richness and complexity of all that’s gone before. The use of the spatial plane has also been mixed up a bit in this work. This functions in one sense as a landscape; there is a horizon line and the house has suggestions of perspective. At the same time, it’s a flat plane, not a realistic foreground-background. I view these roots and all the underground patterns like a cut-away view, as if we took a vertical slice of reality and could see above and below at the same time. Yellow sky above. Patterned blue textures below. This cutaway view then also suggests the passage of time. The roots are not reaching down into a static moment now. They are reaching into all the history and story that compromise the home. I remember that I started this work when I needed an emotional respite. Just before this, I had created a work that is quite chaotic. Trees grow up and uproot homes and the mood is dark, like a fairy tale story. I felt the need for a new palette and was drawn to thee colors as a soothing change. But, as it developed, I began to see that the complexity of the patterns created an opening to more meaning. Some family histories are warm and cherished. Some entail secrets and hurts. The exact nature of the past is not defined at in this work. Like real life… It’s complicated. Here’s a video with closeups and some insights into the work in progress. Reading what somebody else has written about you is a bit like reading your own epitaph. Except you're still here! The whole process can be a little scary. But I always appreciate the chance to explain what my work is about to various arts publications. It's a good discipline to condense thoughts down to a certain number of words or meet other publication parameters. Many thanks to Artsyshark for this promo piece in May of 2018. 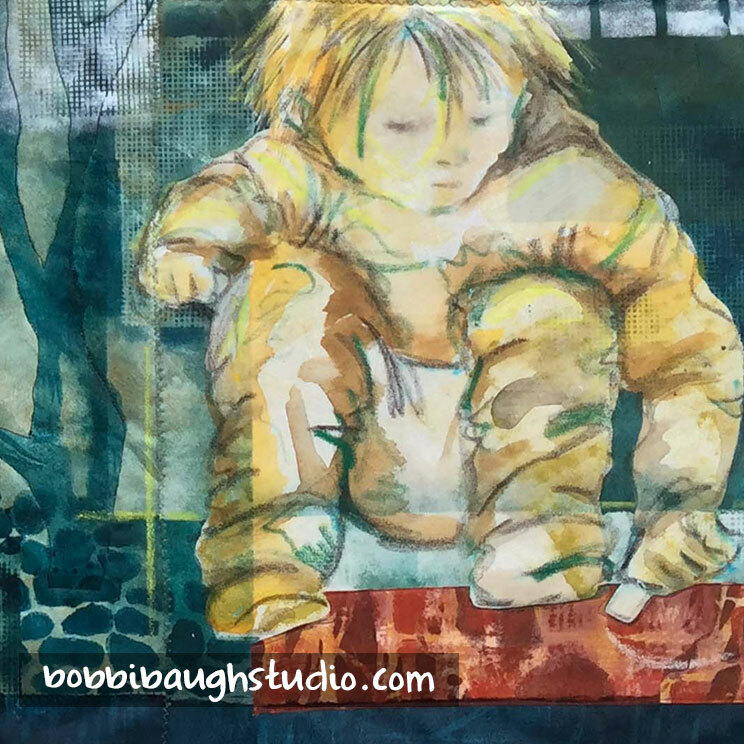 Artist Bobbi Baugh knows that everything has an inner story, one that isn’t visible from the exterior. 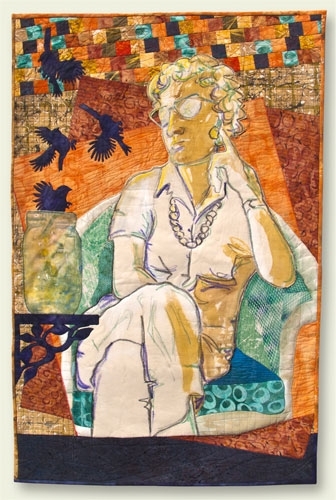 Through her textile collaged quilts, she works to express forces beneath the surface. Life experiences can come together in unexpected ways. As an undergraduate art student over forty years ago, I concentrated in watercolor and drawing. In my career before being a full-time artist, I worked in the printing industry, surrounded by the rhythms of platemaking, pulling an image, re-inking and printing again. And, from the time I created homemade A-line skirts on my mother’s sewing machine as a teen, I have enjoyed sewing. 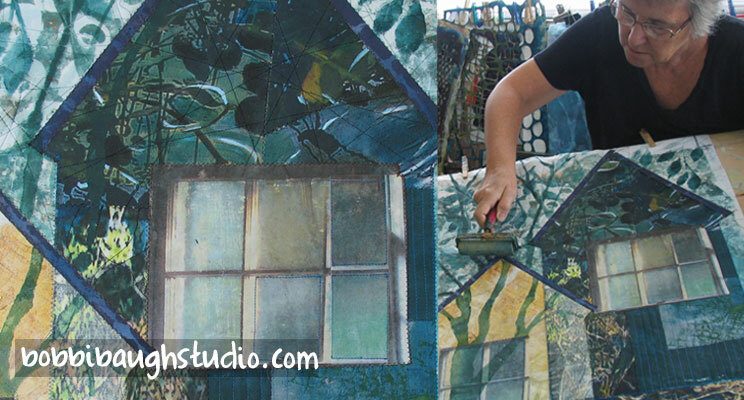 Now, I create textile collaged works and art quilts, using all of those experiences. Everybody has a story. Every thing has a story. Whether we are looking at a person, or a structure, or a part of the natural world, what we see is not all there is. There is always more going on. That’s what interests me. I’m intrigued with depicting a visible object along with the suggestion of its inner reality in the same composition. Looking at a group of houses, we see only the outside walls. But there are rich and varied lives within. Looking at a natural scene, we see the visible parts of plants and trees. But there are forcesand patterns playing out beneath the surface at the same time. Looking at a person, we see just the exterior. But there is a journey, and there are dreams and memories, inside and at work. My artmaking methods are a perfect fit with this interest. Every piece I create has four component phases. First is concept and composition. I work out ideas in my sketchbook to explore visual arrangements of my ideas. I enjoy working in a size of 36-48” in either dimension, so I frequently mock up the composition on paper at full size. It’s a test of the concept, and the beginning of a pattern for creating and assembling the parts. Second, I create the fabrics that will be used in the composition. I begin with blank cotton muslin and blank sheer polyester. The fabrics are printed by hand as monotypes, or as relief prints, or handpainted, stenciled, stamped, or resist-imaged. I frequently mix up techniques on each fabric piece. I create fabric for a specific work. Generally, there is fabric left over. So, the leftover pieces from previous pieces may also be used in a new piece. My stash of printed fabrics is a favorite resource. Third, I collage. 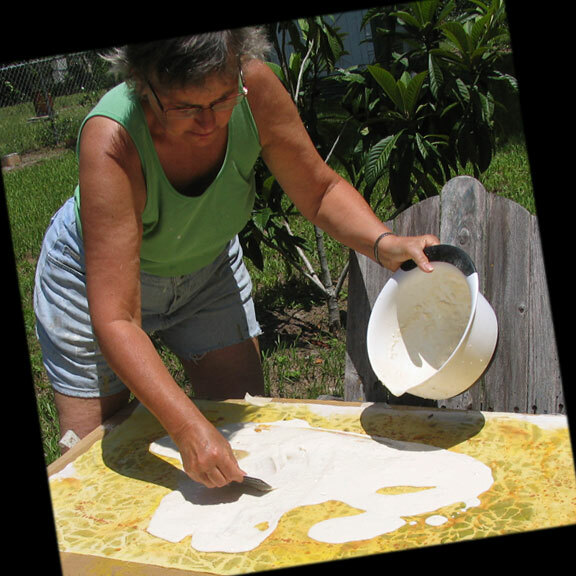 I use acrylic-based medium for collage so that the artwork is archival and everything is compatible with acrylic paint. 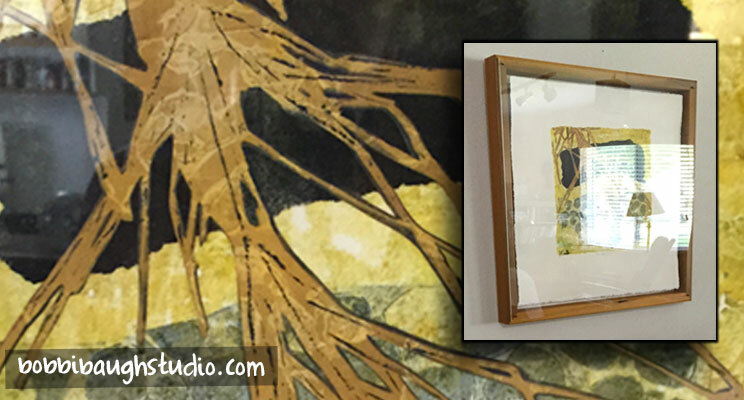 Sheer pieces are collaged to a heavier backing to be stabilized. Cut pieces are collaged as applique. Finally, I machine stitch. I use stitching as a method of joining sections together. And on almost every piece I add patterns of machine stitching for texture and depth. The finishing is also done by machine stitch; sewn strip binding is turned for a finished edge, and the assembled work is fabric-backed with a rod pocket for hanging presentation. I have created and experimented with other artmaking methods. 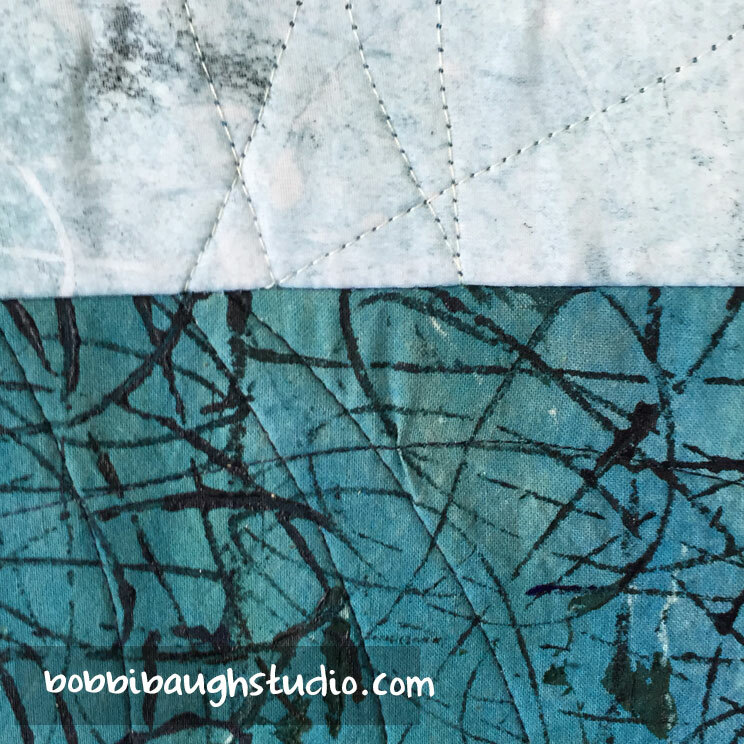 Working with textiles and collage is where I find the best expression for my ideas and where I am most at home. When I created this portrait of Lillian -- my grandmother -– I was intrigued with trying something different. I wanted to create a portrait that suggested something of her life story. It helped that I created “Lillian’s Expectations” to submit to the SAQA “Balancing Act” exhibit. (It was juried into the show and it traveled for two years.) The concept of depicting balance – or an attempt to balance things – gave me a starting place. 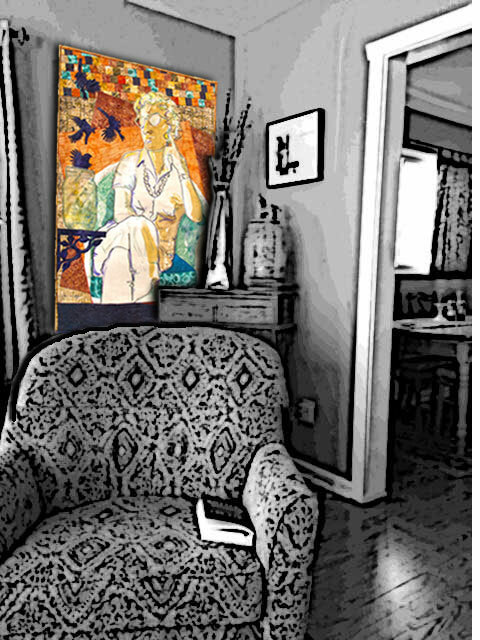 I have a photo of Lillian seated in a wicker chair like the one I depicted. She is the essence of a strong and self-possessed woman –- completely confident and assured. I was really drawn to the gesture of the single finger supporting her head. The colors closest to her are also calm and soothing. But, all around her, things are off balance and chaotic. Two large rectangles are askew. The patterned squares across the top are on an angle. The colors are hot. Knowing Lillian’s story, I knew she had to balance strong and opposing forces in her life. Her ability to stay in command in the face of that is the point of the story. Well, and then there are those birds flying out of the jar. Some things are beyond being controlled. Forces become unleashed. People’s stories and events can just spill out, tossed about like a small bird the wind. I rediscovered this artwork today as I was going digital through images of my work. Much like discovering a faded family photo in an album, finding Lillian’s portrait caused me to remember. I remember the process of creating this piece. I remembered all the sketches I created before I began, working out the relationship between idea and composition. I remember printing these fabrics. I remember drawing the figure. And I remember Lillian. I hope my work does justice to her interesting and complicated story. I was organizing works-in-progress in my studio this afternoon and picked up the piece that includes this crouching child drawing on the ground. Where had I just seen this child? Aaahhhh… the beach. I was in New Smyrna this morning to deliver some work to Arts on Douglas Gallery. Beforehand I gave myself the treat of some morning beach time and a nice walk in the water. The weather was perfect and it felt wonderful. From my post on a sandbar I looked back at the beach to watch the earnestness of a toddler, crouching, just like the pose in my quilt sketch. She was wearing a bonnet. She had beautifully chubby little legs. She squatted so that her bottom was touching the cool water, and she was completely absorbed in… something. It might have been watching ripples. It might have been a mark she made in the sand. It might have been a little crab. Or maybe the simple delight of wiggling toes and watching the sand move. From my position on the sandbar, I could not tell. It made no difference. It was something important to her. She had discovered something and decided it was fascinating and worthy of her full attention. I remember. In fact, as I call upon my own childhood the memories that are most real to me are times of independent absorption like that. I loved to work with crayons. I cut out and played with paper dolls. Outdoors, I would make small creations of twigs and grass and stones to make houses. As I have drawn on memories and dreams to develop my current body of work dealing with home, the crouching child, absorbed in her drawing, seemed a perfect symbol to include. Incorporated into a composition of house and tree forms, she is a vehicle to lead a viewer to remembering. Just as I could not determine the exact task of my little friend at the beach today, the exact purpose or subject matter of this crouching, drawing child is unspecified. But through her, we can wonder. And we can remember. I STILL wonder about the people across the street. Do you? Do you still carry with you – as in your pocket - images from childhood? I can still remember houses on the street where I lived. I remember walking past them in the evening and looking in the windows. I believe it was part of the process of sorting out my place in the world. Was my family the same as other families? What would it be like living in somebody else’s house? How did I feel about my own home and my place in it? I created “Wondering about the People Across the Street” in 2014. I had not begun the current series about home, but certainly the memory of childhood was in my mind and urging me to create something. I was drawn to bold coloring book colors to emphasize the childlike quality of the memory. And I wanted the figure on the porch to be a simple silhouette. She is both my childhood self and every other child. Here’s a detail of a work in progress in my studio now that reveals my ongoing wondering about life beyond the windows. When the rain finally broke earlier this week, I knew it was time to spring into action. I had lots of yardage that needed painting, and we’d had nothing but rain. I set up a 6-foot door on sawhorses right outside my studio door on a concrete area which I gave up trying to keep clean a long time ago. I can drip without fear here, and a nearby fence section provides a place for drying. I generally start with plain unbleached muslin for my quilt backs and then create painted patterns compatible with the quilt’s front. I like to work wet and fast. First I used the garden hose in a fine spray to get my yardage pretty well damp. With a wet natural sponge and acrylic paints, I got down the background color, a deep violet blue. I hung it on the fence to dry. That ‘s when the first unexpected surprise occurred. As I lifted the muslin off my table, the vinyl cover over the surface had pools of water and paint in beautiful patterns. It was a now-or-never opportunity. I quickly went inside and grabbed a few yards of sheer polyester, brought it out and gently laid it down in those irregular pools. What a beautiful surface design I’d captured! Next I needed some teal fabric, so I mixed the color and sponge painted about three yards of that, wet into wet. Again, when I lifted it up off the table, beautiful irregular pools were there. I picked up the sheer that had violet blue on it already, and pressed it into the table surface again. Aaaah! 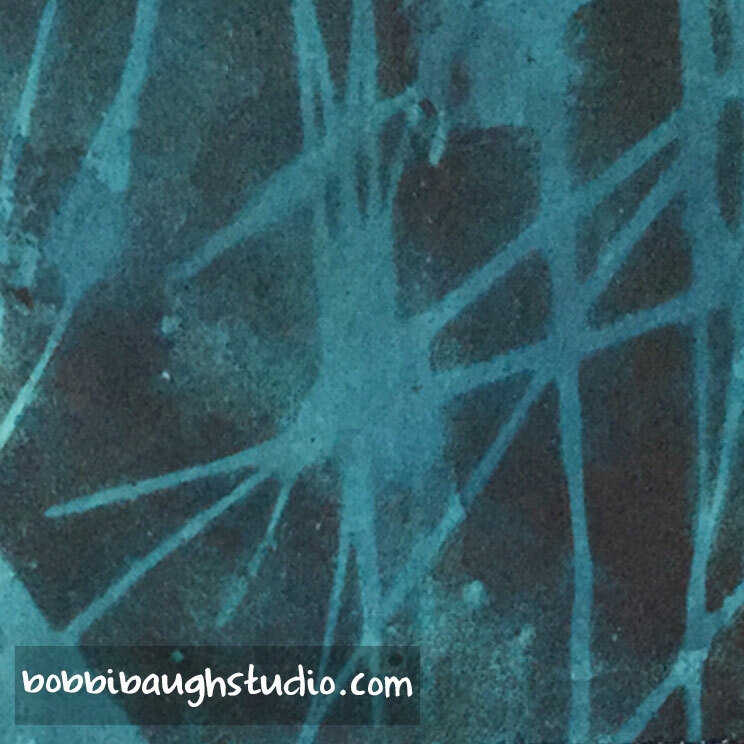 After all this dried (in a wonderfully short time, thanks to the Florida sun) I painted abstract tree forms, again using the wet natural sponge, but this time with stencils, both the muslin and the sheer. Result: I have some muslin for quilt backing plus some watercolor-like sheer polyester to incorporate into a quilt front. And a little more spatter and drip on the concrete.